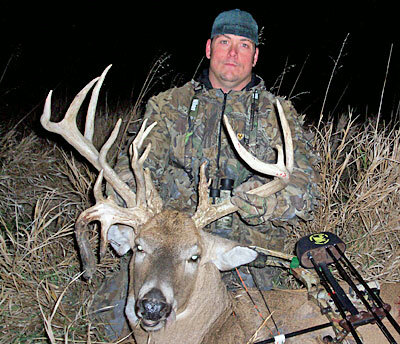 Clay Burkhardt's first bow buck just might be his best! This is my first year bowhunting and my first buck with a bow. I had pictures of this deer from my trail camera near the end of September and through October and I knew he was a deer I wanted to try and take. I hunted for him about every chance I had since the first of October. On the 18th, I had a chance at this buck as he came right under my treestand, but with me being an idiot (and new to the sport) I stood up and well...he took off. I learned a valuable leason that day in bowhunting. On the evening of October 23rd, I got lucky and saw him step out again&apos;¦and he was within bow range, but it was right at last light and he was quartered away most of the time. Being new to archery I wasn't comfortable taking the shot at that angle and with low-light conditions. I just watched him for twenty minuets, feeding in my food plot. He finally went on his way. I wasn't disappointed...just thrilled I got to see him again. Two days later, the wind was humming around 20mph but was supposed to die down toward evening. Around 4:30 p.m., I went to the stand where I saw him Sunday night. The wind wasn't treating me right and I thought about backing out of the stand at one point, but decided to have faith in my scent control. There wasn't a lot of deer movement and I thought they must be held up for the evening. Fifteen minutes after sunset I caught movement down the trail to my left...it was him. I thought he was going to bust me as he was down wind, but he never did and instead got wind of the dominate buck scent I had in a Tink's Scent Bomb. He actually turned and ran into where I had positioned the scent. He stepped right in front of me at 18 yards and quartered away just like he had a few days prior. I had played that shot through my head a hundred times and received advice from another bowhunter about where to aim at that angle. I drew back, sank in, took a deep, deep breath and put my pin on him. My lumenok was all I saw as the monster darted off. I thought I might have hit him too far back. I watched him till he was out of sight and heard him go down hard in the field. I didn't know if he got back up or not, so I waited a long thirty minutes before climbing down. I was shaking so much after the shot I thought I was going to fall out of my stand. The arrow went in just in front of the hind quarter and actually hit his heart. He didn't go fifty yards. He has twenty score-able points, three drop tines, three main beams at the base on the one side and a 19-inch spread. The absolute buck of my life.